With all four teams in the Chase, Hendrick Motorsports headed into Dover hoping to finish well and improve their points standings. With Jimmie Johnson and Jeff Gordon combining for 11 wins at the track, the organization brought a solid database with them and hoped to capitalize on their strengths and improve their positions. Would they be successful or would championship dreams or would they fall victim to Miles the Monster? Johnson pulls into the garage during Friday's practice. Dover. 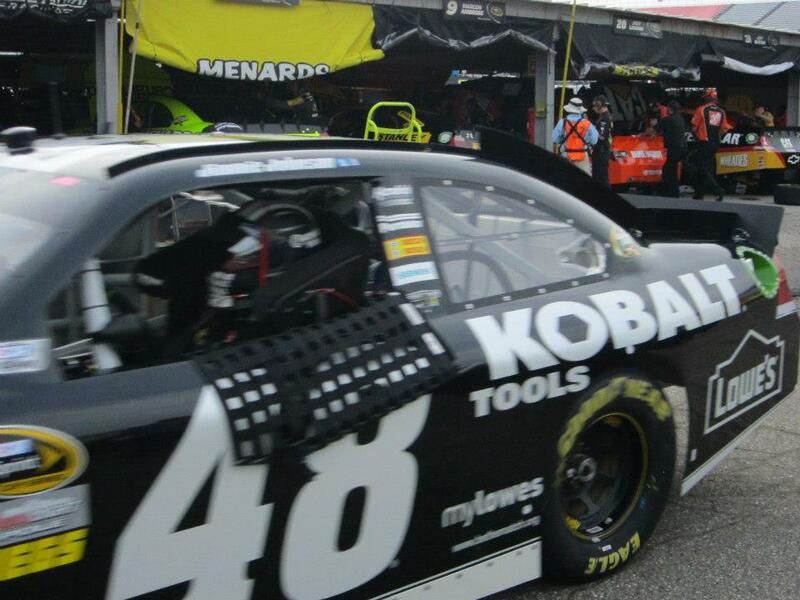 The Monster Mile is Jimmie Johnson’s track, having seven wins here including the June race. With the points lead, Johnson looked to be starting the weekend off right, could he sweep Dover? Starting the race in 11th, Johnson quickly made up positions into the top five. Through the rest of the race he maintained his position inside the top five, looking to grab the lead. When the caution came out on Lap 308, with a fast pit stop Johnson came out of pit road first. On Lap 316 the green flag waved for the restart and Johnson was off, finally getting the lead he'd wanted all day. Johnson went on to lead 43 laps, but was short 8 laps of fuel, so crew chief Chad Knaus told Johnson to slow down and save fuel. As the No. 48 slowed, the No.18 of Kyle Busch stole the lead as Johnson kept slipping back due fuel mileage. Johnson may have lost the race, but because he stayed on track without running out of fuel and finished fourth, he is now second in points, just five points behind leader Brad Keselowski. When asked about his reaction to being told to save fuel, Johnson said, “Well, for starters, we’re not very good at fuel mileage races. So, when I heard that, I’m like man, we’re in big trouble. And he asked me to start saving fuel. And I doubled the distance out of the gate just to make sure that I did enough to get us to the end. So, it’s tough; it really is. But we have a handful of races that come down to it each year and we’ve worked to get better at it. And this is like the second of 15 or something that we’ve attempted to finish in a low fuel situation and got it done. So I’m improving and we’re improving. I wish we could have raced for it. We finally got control of the race, late, but it just didn’t unfold like a normal race here." Starting 25th, the worst out of the Chasers, Dale Earnhardt Jr. needed some sort of miracle or a fast No.88 to get to the front. 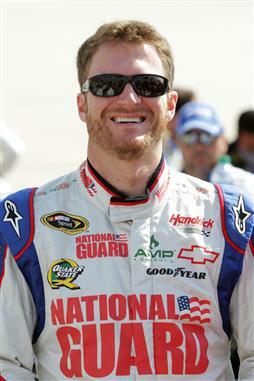 Within the first 46 laps Earnhardt Jr. had moved to 17th position and looked to be gaining more spots. He was 11th going into the pits on a green flag stop when caution came out and hurt the No.88 team by trapping them a lap down. Only quick thinking by his spotter kept it from being two. For the whole day Earnhardt Jr. battled being a lap down, never able to take the wave around. He was forced to just race for the lucky dog position. He managed to keep up with the leaders and race with them, however he just couldn't get the free pass. Earnhardt Jr. finished his day in eleventh, one lap down. He's still seventh in points, 39 out of first place. 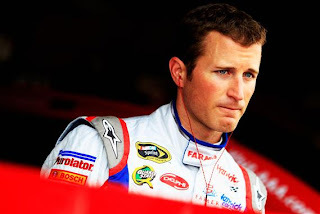 Rolling off ninth at the Monster Mile, Kasey Kahne hoped to improve his fifth-place standing in the Chase, but the No. 5 team broke the cardinal rule of racing: don't beat yourself. Kahne ran well, only falling out of the top ten once when, as many teams did, he got caught on pit road when the caution came out on Lap 70 during green flag stops. He fell to 13th, but fought back to 8th and eventually got the lucky dog pass back onto the lead lap. However, with fewer than 50 laps to go, Kahne felt a vibration that made him think he had a loose wheel and with 39 to go, pitted for tires. Unfortunately the No. 5 crew left off a lug nut and Kahne had to pit again, putting him in 15th place, which is where he finished, putting him sixth in points. 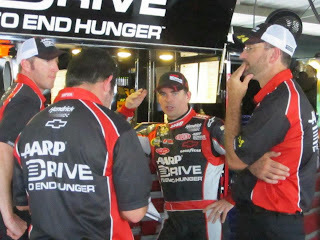 With his chances of scoring his fifth championship shaky at best, Jeff Gordon exhibited the same grace under pressure he has shown for the last 20 years. While he didn't score the pole as he did last week, he did start in seventh position and despite handling issues, managed not only to stay on the lead lap but with crew chief Alan Gustafson's pit strategy of topping off under caution, avoided the fuel mileage concerns that plagued many of the other top teams. Gordon ran in the top ten all day, often battling with teammates Kahne and Dale Earnhardt Jr. for position. During the final long green-flag run, Gordon held on as one after another of the leaders peeled off to pit road for fuel. The No. 48 slowed to conserve fuel and that left Gordon chasing leader Brad Keselowski along with Mark Martin, who ended up finishing third to Gordon's second. "You know what? Today was a good day; a solid day. The car was good. We were better on the long runs than we were on the short runs." Gordon said. "We just couldn't get going on the restarts. The front tires would just not work. I don’t know; maybe the splitter was hitting or something. So we had issues with that. We were trying to resolve those and it actually worked to our favor because we had to come in and top-off and make a couple of adjustments and then we didn’t have to save fuel there at the end and the car was really good." During the post-race media availability, Gordon was asked how frustrating it was to finish second but still only gain a few points on the points leader. "Yeah, you guys focus too much on the top guy and not enough on fifth place, he said. "We have to look very realistically at this point. It's only been two weeks since we had our incident in Chicago. We've gained a tremendous amount of points on fifth place, sixth place. We did that again today. We're not going to continue this championship against those guys up front if they keep running the way they're running. The only way we're going to get a chance at them is if they have a problem like we had." Mark Martin, who finished second to Gordon many times over the years, chimed in, "By the way, it feels really good, regardless of the points, to run good. It's real easy to get your back end handed to you out there. Those guys are tough. Everybody's tough on the racetrack. So when you run good, it feels good."